The lab has participated in the FENS Cajal Advanced Neuroscience Training Program in the Bordeaux Neurocampus, organized by Laurent Petit, Andreas Frick and Olaf Sporns: Connectomics: from Micro- to Meso- and Macro-Scales. During this course, we performed a mouse behavioral test, cleared the brains with iDISCO+ and imaged them with a light sheet microscope that was generously lended by LaVision Biotec for the duration of the workshop. The data were then analyzed with ClearMap. We were lifted by the energy displayed by the students, and the helpfulness of all the staff members and the rest of the Bordeaux Neuroscience Community. We'll be back to teach at the Bordeaux Neurocampus for the Cajal School of Developmental Neurobiology and Pathologies! The lab has been awarded an ERC starting grant to work on the molecular mechanisms of large-scale adult structural plasticity of the axons. This 5 year program builds on the genetic strategies devised to study brain development, combined with the modern imaging techniques, to study how axon stability is controlled by neuronal activity in the brain. Thomas was awarded a competitive Phd Fellowship from the ED3C to start his project on how brain plasticity affects behaviors in the adult mouse. This project will built upon the findings from his rotation undergrad work. The lab space is ready ! 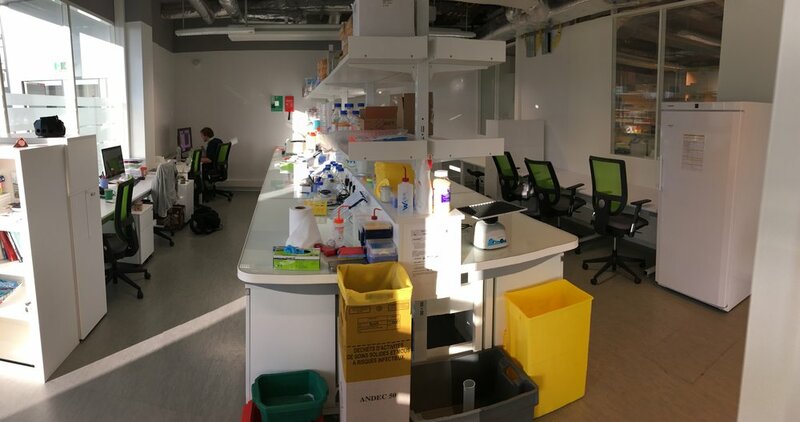 We moved into the new main lab space, which is a combined space with desks and benches for molecular biology work. The space also hosts the workstations for image analysis. It is adjacent to the Hassan lab space, with some ressources shared across the labs. We received our brand new LaVision Ultramicroscope II. It is installed in the core facility PICPS on the 5th floor of the building, and was operational in just a few hours. We use a system with swappable objective lenses and 3 fixed light sheets on each side. This piece of instrument will be essential to image the iDISCO+ cleared samples. Construction starts in the lab ! February - We received all the construction materials to start furnishing the lab. This will be an office - bench mixed space, allowing for an efficient workflow between the desk and the bench. The main space is designed to accommodate 8 people and 2 shared workstations.